New Jersey Snow & Ice Accident Attorneys | Tomes & Hanratty P.C. With the arrival of winter storms and freezing temperatures in the Northeast, walkway conditions can be dangerous for pedestrians and consumers. This is especially true when snow and ice are not removed in accordance with local ordinances and regulations designed to protect the public. If you are injured because of weather-related hazards, you may need to consider your legal options. If you can prove that the landowner responsible for the abutting sidewalk knew about the condition or reasonably should have known, you may need to bring a lawsuit to recover damages for the impact to your life. You could be compensated for your medical bills, lost wages during recovery, and more. If you need an effective and passionate legal team to represent your needs, contact Tomes & Hanratty, P.C. for a consultation. If you are injured because of the negligence of a property owner, you should know that you have the burden of proof. This means that you have to prove the negligence of the property owner you think is responsible for your injuries. Always seek medical assistance. These medical professionals will document your injury. If you are able, collect evidence for yourself. Take pictures of the hazard and the general area surrounding it and talk to anyone who may have witnessed your fall. If you cannot act for yourself because of your injuries, contact Tomes & Hanratty, P.C. to act in your stead. Acting quickly is important because weather-related conditions can change quickly by the hand of the property owner or nature itself, erasing any evidence to support your claim. Property owners are responsible for the walking surfaces of their property and the sidewalks adjacent to their property. Municipalities provide ordinances for snow and ice removal after a storm. 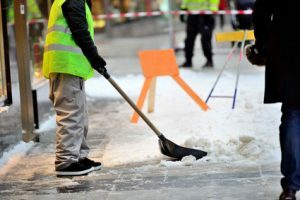 The time allowed to clear walking surfaces of weather conditions after a storm concludes relieves property owners of the liability if you were injured on their property within that time. If the allotted time period passed and you were injured because of standing snow and/or ice, you may be entitled to damages. If your injuries were caused by a municipality’s negligence, bringing a suit is time-sensitive and complicated. Always retain the services of an experienced legal team like Tomes & Hanratty, P.C. If you or a loved one has been injured as a result of failure to properly remove ice and snow from walkway surfaces, please contact us to discuss whether you may have a claim. Our firm has many years of success representing clients who were injured by the negligence of property owners. If you need our legal support to help you recover the compensation you deserve, contact Tomes & Hanratty, P.C.